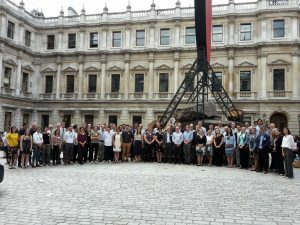 The differences between the English* and Canadian experiences of unconventional hydrocarbon development were apparent at a meeting co-hosted by the British Geological Survey, Geological Society of London and IAH in London in July 2018. 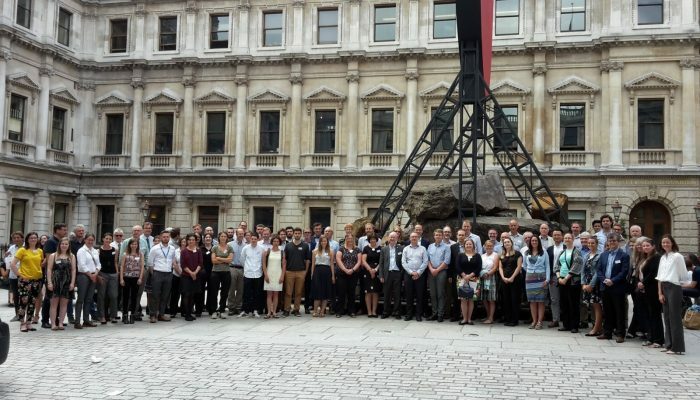 Attendees at the Use of the Deep Subsurface in the UK conference in July 2018 (Photograph by Barnaby Harding). 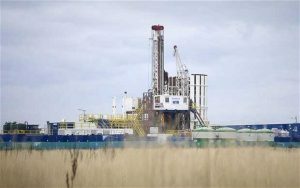 England has been in the exploration stage of shale gas since 2008 and, to date, only a handful of wells have been drilled and the first horizontal test frack began in Lancashire in October 2018. In contrast, in Saskatchewan, Canada, which is home of the northern portion of the Bakken play, over 250,000 oil and gas wells have been drilled since the 1950s. 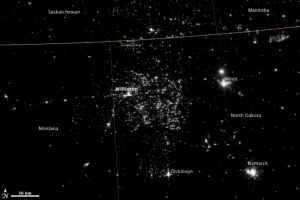 Population density is low northwestern North Dakota and southeastern Saskatchewan, but satellite imagery shows light from oil and gas development in the Bakken Formation (from NASA Earth Observatory). What are the reasons for such a stark contrast? In both cases hydrocarbon rights are predominantly owned centrally, by either the Province (80%) or the Crown and licensed through the UK Government. Recent mapping and a series of reports by the BGS has suggested some potential for a range of hydrocarbons, including unconventional resources. However, an in-depth review process to be able to drill and test an exploration well in England may take years, owing to the multiple agencies and authorities involved in the decision making (Whitton, et al., 2017) and may encounter considerable controversy. There have been similar concerns about oil and gas development in Canada, which are highlighted by a review by the Canadian Council of Academies (Cherry et al., 2014). However, this has happened following decades of oil and gas production and has not impeded development in western Canada. In Saskatchewan, production wells are typically permitted within a matter of a few weeks and there are rarely comments from the public. In addition, population density is vastly different; England had a population density of 401 people per square km in 2010 (link) versus less than 4 people per square km in Saskatchewan (link). However, the conference highlighted that other, hydrogeological and geological factors may also be important, and the state of hydrogeological knowledge is a key factor. Data from oil and gas wells drilled in Saskatchewan, such as stratigraphy, volumes of produced fluids and fluid chemistry is available to the public after a short confidentiality period. This has allowed for mapping of the subsurface and hydrogeological analyses over many parts of the region. Few impacts to groundwater have been documented, although monitoring is relatively sparse in Saskatchewan with only 70 monitoring wells over an area of 651,900 km², roughly twice the size of the UK. The majority of documented contamination incidents associated with oil and gas production are surface spills of either oil or produced waters. Flowback and produced waters are typically injected back into the subsurface. Strata used for disposal have been well characterized in most areas due to exploration and production activities by the oil and gas industry. There is some uncertainty about the long-term fate of injected fluids. The biggest unknown in Saskatchewan and many other areas with extensive histories of oil and gas production is the nature of the intermediate zone. This interval, which is situated between the deepest aquifer capable of supplying potable water and the oil and gas producing zone, is typically data-poor because of a lack of investigation and monitoring. Base of groundwater protection mapping has not been done comprehensively for most of Saskatchewan. However, the presence of thick Cretaceous shales are thought to provide adequate hydraulic separation between oil and gas producing zones and overlying fresh groundwater supplies. Large scale faults are uncommon in Saskatchewan, aside from collapse features related to the dissolution of the Prairie Evaporite. The most likely pathway for contaminants to reach the surface in most cases is through poorly completed or abandoned wells. Leakage of methane through wells appears to be fairly common, but it is unclear how widespread upward migration of poor quality groundwater might be. Onshore oil and gas is not new to the UK – it has a 150 year history of oil and gas production and there are currently 250 producing wells at 120 sites (link). In the 1980s the BGS compiled temperature and chemistry data, where available, for over 1150 sites (Rollin, 1987) as part of an investigation into deep geothermal energy, although the median depth was only 1000 m, still providing a very limited window into the subsurface, particularly when considering the variability of geological settings resulting from its complex structural history. For example, the basin size in the UK is on the order of ~40,000 km2 and has undergone multiple periods of deformation. Conversely, Western Canada Sedimentary Basin, which covers large parts of Saskatchewan and Alberta, has an area of the 1,400,000 km2.and is relatively undeformed in Saskatchewan. 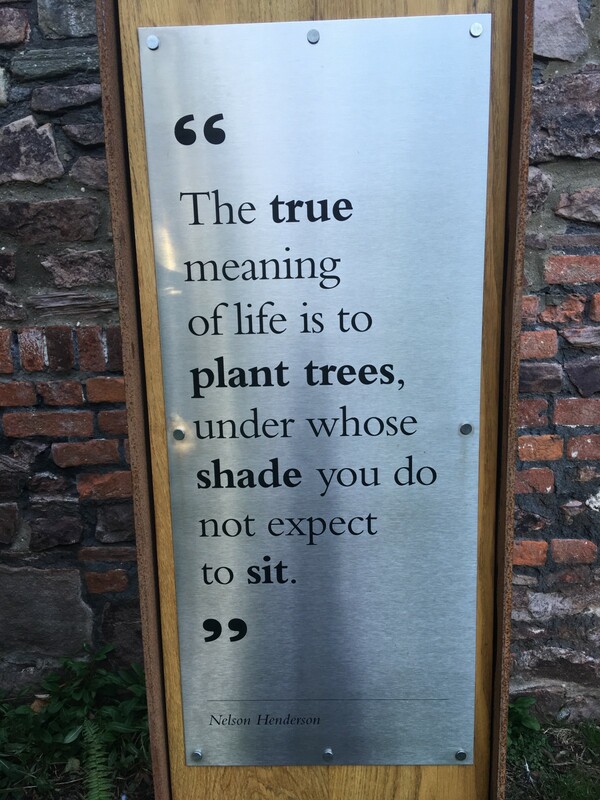 The decision making process must therefore be more site specific in England. In relation to groundwater, possible pathways from hydraulic fractures initially received most public attention in the UK. However, legislation (the Infrastructure Act, 2015) means that High Volume High Pressure hydraulic fracturing must take place deeper than 1000 m below the land surface – very few hydraulic fractures likely bridge this distance (Davies et al., 2014). The relatively high density of faults across all of the basins (resulting from this complex geological history) may be more of a concern if they could form permeable pathways since they tend to be longer, although the potential for flow along these faults is largely unknown. As in Canada, well casing and integrity is also a possible issue, but there are stringent controls on this – nevertheless, horizontal drilling may pose more of a problem in some instances (Bachu and Watson, 2009). In England, all groundwater must be protected (Water Framework Directive, 2000) for human use/ecosystems. If little is known about the conditions in the subsurface, then the precautionary principle must be applied. In practice, however, depths within 400 m of the land surface –depths that most groundwater is abstracted from – is used a default maximum depth. In North America, some jurisdictions define a base of groundwater protection based on depth but some may also do this on salinity (Lemay, 2008; DiGiulio, et al., 2018). There were discussions at the conference on how the depth of groundwater should be defined. The conference provided a useful forum within which to share experience from North America, and the advanced Bakken Play in Canada, with delegates from the UK hydrogeology industry. 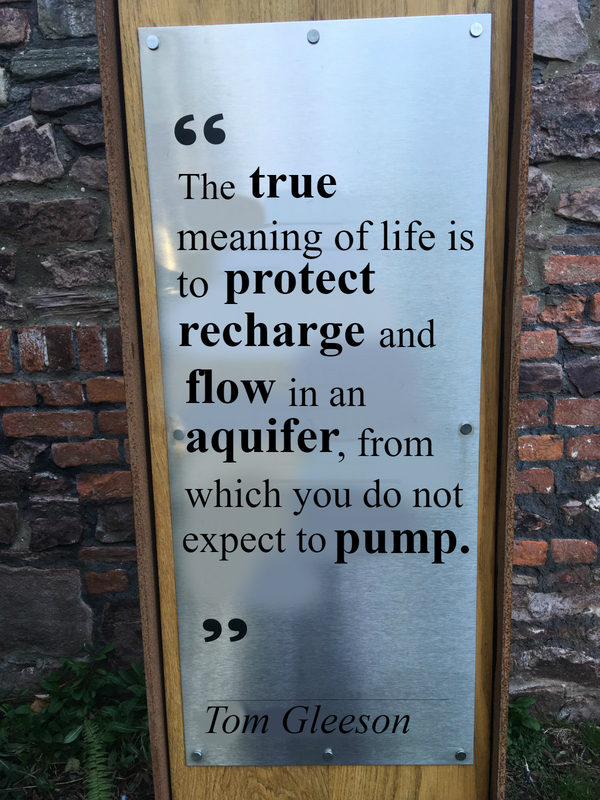 It was clear, however, that while there is a lot of learning to be done from these examples, due to the differences both in legislation and geology, the UK hydrogeology community should not use these examples as a direct analogue for the UK industry. Cherry J, Ben-Eli M, Bharadwaj L, Chalaturnyk R, Dusseault MB, Goldstein B, Lacoursière J-P, Matthews R, Mayer B, Molson J (2014) Environmental Impacts of Shale Gas Extraction in Canada. The Expert Panel on Harnessing Science and Technology to Understand the Environmental Impacts of Shale Gas Extraction Ottawa: Council of Canadian Academies. Lemay TG (2008) Description of the Process for Defining the Base of Groundwater Protection, Edmonton, Alberta, pp. 27. Rollin KE (1987) Catalogue of geothermal data for the land area of the United Kingdom. Third revision: April 1987. Investigation of the geothermal potential of the UK. British Geological Survey. Plagiarism is a clear contradiction of scientific values and practice. 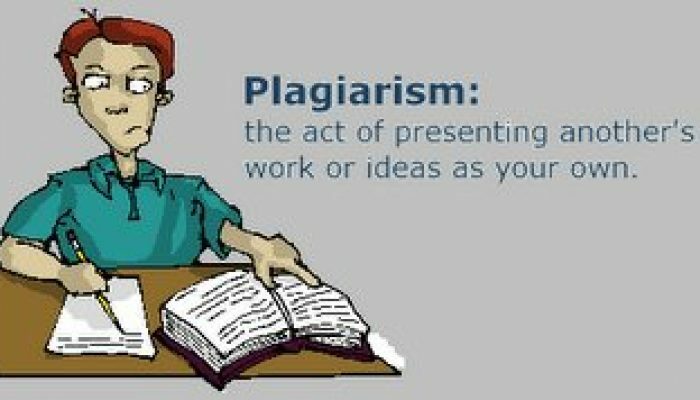 Although no universal definition of plagiarism exists, a useful working definition is the wrongful appropriation, stealing and publication of another author’s language, thoughts, ideas, or expressions and the representation of them as one’s own original work (wikipedia). Plagiarism in our digital world can be too easy – although journals have stepped up on electronically detecting and policing plagiarism (Nature, 2010), there is evidence that plagiarism remains depressingly common (Science and Engineering Ethics, 2015). A case of documented plagiarism in the hydrologic sciences offers a number of lessons about how every one of us has multiple roles in making hydrogeology free from plagiarism. An extensive investigation and review by the Kansas Geological Survey and the University of Kansas concluded that seven papers written by Marios Sophocleous contained extensive plagiarism and self-plagiarism. Yet some of these plagiarized papers are still routinely cited – for example, Sophocleous (2002) has been cited >500 since the public censure in 2013. The detailed report of the detection and investigation of this plagiarism as well as the response by journals and suggestions on paths forward was written by Jim Butler: Draft Report on Plagiarism. To get a better sense of the style and scale of the plagiarism it is useful to examine a marked up version of Sophocleous (2002) – a highly cited paper on groundwater surface water interactions: Sophocleous_GW-SW HJ Journal 2002 KGS Analysis for distribution. The University of Kansas requested four journals to retract seven different papers published from 2000 to 2012. Although there are different forms and severity of plagiarism, we concur that this is a clear and unambiguous case of plagiarism, and is totally unacceptable. Retraction Watch wrote useful summaries of the varied response of journals to this request for retraction: Groundwater and Natural Resources Research retracted articles (Retraction Watch post) while Journal of Hydrology and Hydrogeology Journal refused to retract (see Retraction Watch post; Hydrogeology Journal editorial and Journal of Hydrology editorial which usefully lists original sources but unfortunately is behind a paywall). The articles were not retracted from Hydrogeology Journal because 1) “the reference from which the material was copied verbatim is given close by in the text by Sophocleous” implying “he was giving credit to the previous authors from which he copied, and not hiding the fact that the material was not his own.” and 2) the articles are highly cited which shows “clear value to the scientific community” (Hydrogeology Journal editorial). There are differing levels of plagiarism (including clear plagiarism, minor copying or redundancy) recognized by the Committee of Publishing Ethics which offered advice to Hydrogeology Journal and Springer on this case but the argument that the number of citations should have anything to do with whether a plagiarized article is retracted is spurious and irrelevant, and sets a dangerous ethical precedent. When popularity is considered to absolve the need for methodological rigor, and when it trumps the motivations and ethics behind our actions, we are not in a good place as a profession (or a society). Cliff Voss, Hydrogeology Journal Executive Editor, also clarified recently that he considered attaching an editorial to the non-retracted articles a better lesson in plagiarism since the plagiarized articles are then more visible for everyone to learn from, rather than just disappearing if they were retracted. Part of the challenge of this case is that most references in the papers were not identifiable by plagiarism detection software because many were local reports or old references that are absent from the widely used database systems as explained by the Journal of Hydrology editorial. Instead, the assessment by the Kansas Geological Survey consisted of identifying possible copied passages and then electronically searching potential sources. The Kansas Geological Survey has importantly offered to make their analyses of the papers discussed in the Hydrogeology Journal editorial available upon request. In a strange twist of fate, one of us (Tom) collaborated with Marios on two papers on groundwater sustainability as a postdoctoral fellow – totally oblivious to the pending investigation into his papers. For both groundwater sustainability papers (Gleeson et al 2010; Gleeson et al 2012), Tom lead the writing with a number of other coauthors editing and contributing text – Marios largest contribution was to the ‘High Plains Aquifer’ section of Gleeson et al. 2012. Given the above limitations of plagiarism software, Tom conducted his own investigation of this section, going line by line through and electronically searching potential sources for each line. He did not find any lines that had clearly come from other sources and found that the referencing was proper and consistent at the end of sentences throughout this section. How can we make hydrogeology free from plagiarism? Be vigilant about plagiarism in papers that you are citing and stop citing papers that have documented plagiarism. In the case of the papers part of a public censure for plagiarism from University of Kansas, instead request marked up version from the Kansas Geological Survey and cite the original sources of text; this is more ethical and will lead you to some interesting old literature that deserves citing. Be vigilant about plagiarism with your own writing and the writing of your coauthors – now every time we start to copy any text we stop, and consider whether this could potentially lead to plagiarism. For educators – use this case as an example to talk about plagiarism in your classes. We have done this tactfully a number of times in senior undergraduate and graduate classes. What are the incentives and pressures which drive people to plagiarize like this case? Is there a problem with the system of rewarding researchers who publish large numbers of articles (e.g., through improved chances of securing tenure and/or academic promotion)? How can we properly acknowledge the source(s) of our ideas when there is so much literature out there which overlaps and recycles old ideas? 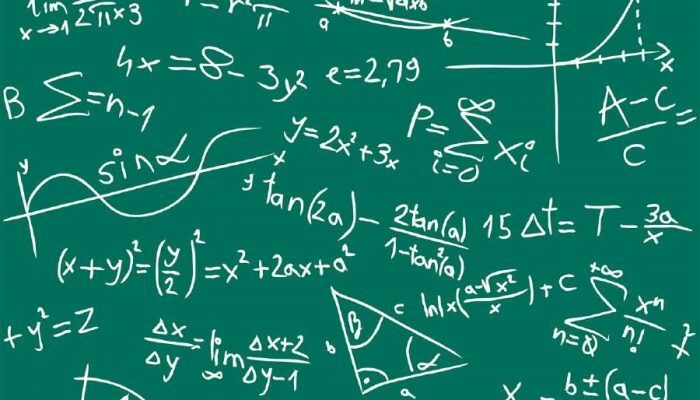 Want to contribute to IAHS’ discussion about 23 unsolved problems in hydrology? The International Commission on Groundwater is going to submit a few problems via the LinkedIn forum. A few of us at Water Underground are going to put our thinking caps on and submit a problem or two. If you would like to be part of the discussion very early in 2018, get in touch with Tom Gleeson. 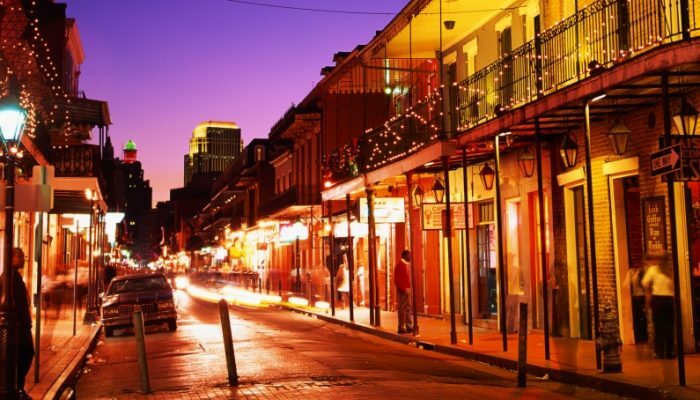 AGU fall meeting New Orleans – what we’re most looking forward, to reduce your FOMO! 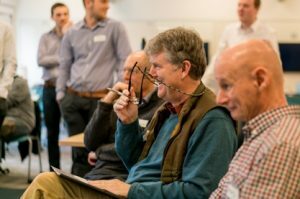 On Sunday the fun kicks off with the Hubbert Quorum (link) – a nice and informal meeting with lots of interaction. On Tuesday is Mars Underground: Subsurface Waters, Diagenesis, Hydrothermal/Metamorphic Processes, and Their Importance for Planetary Evolution (P24B; link). P.P.S. 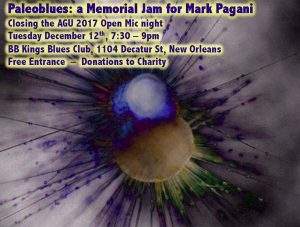 If you can’t make AGU, the virtual meeting AGU On-Demand live stream and later YouTube archiving of selected sessions is great (link), especially check out the Monday 10:20-12:20 Union session on “Creating Inclusive and Diverse Field and Lab Environments Within the Geosciences” (link). P.P.P.S. FOMO is fear of missin out! Listed compiled by Tom Gleeson from suggestions by Anne Jefferson, Grant Ferguson, Elco Luijendijk, Sam Zipper, Andy Baker, Mark Cuthbert. Water Underground creator Tom Gleeson gave this talk at a session called “How my water research made the news” at the 2017 EGU General Assembly, in Vienna. For more about the session check out the Young Hydrologic Society blog or the EGU session description. 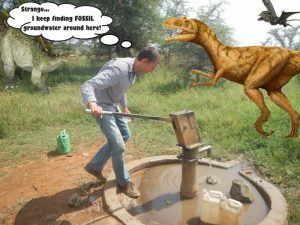 My attempt at a New Yorker cartoon…about finding fossil groundwater! See the paper that was just released by Nature Geoscience! What is the volume (in kegs) of groundwater is stored on earth? a keg is 58.7 liters = 5.87e-11 km3 so there are 1.7 e+10 kegs in a km3. 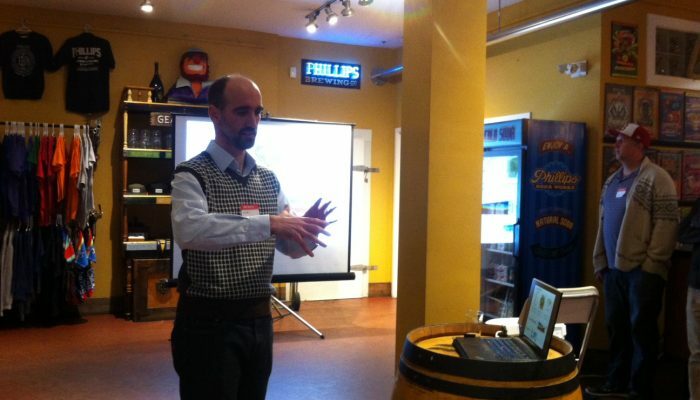 Hint it is more than 1.7 e+10 kegs…. and one person during the evening got it almost correct. 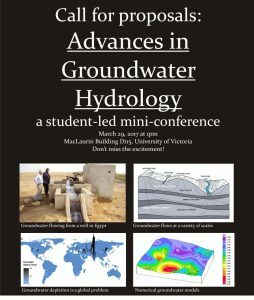 Fourth year and graduate students led a fun mini-conference during class in Groundwater Hydrology (CIVE 445, Civil Engineering at University of Victoria) yesterday. 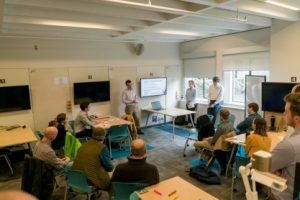 Local consulting and government hydrogeologists joined, making the students both nervous and excited to be presenting to professionals with up to forty years of groundwater experience. The presentations were the culmination of a term-long independent group research project – they also write a research paper (which is peer-reviewed by their classmates). 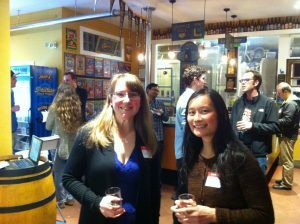 And the mini-conference culminated in beers at the grad club, unfortunately drinking beer brewed with surface water. It seemed like a win-win-win for everyone. 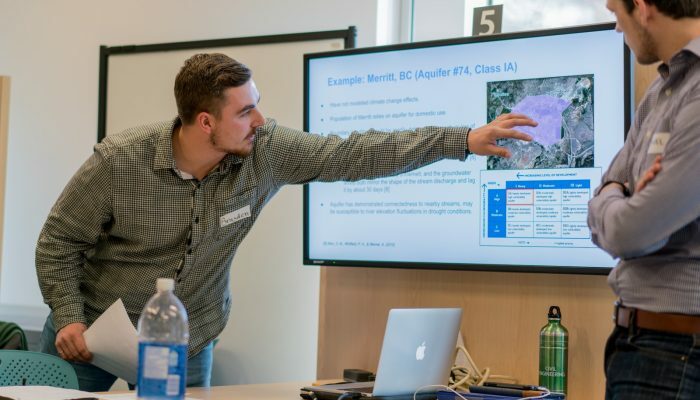 The students loved meeting and presenting to, and being grilled by, the people who had mapped the aquifer they were modeling or asked if their model is based on any real data. The practitioners loved seeing the new ideas and enthusiasm of the students. And I loved seeing the interaction and learning. 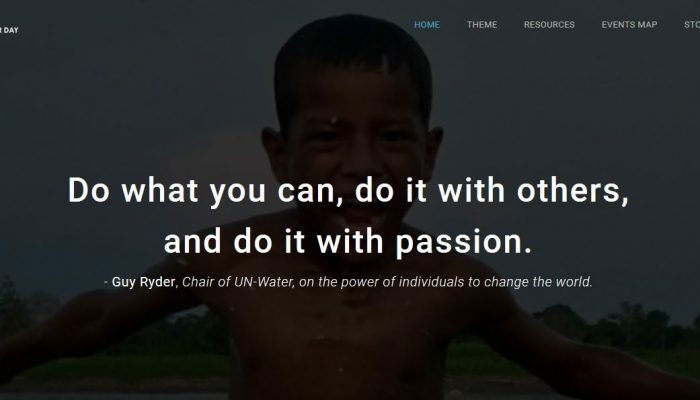 Happy world water day from water underground! We hope you have a great world water day! May you sip a cool, refreshing glass of renewable groundwater and feel excited to make the world a better, more sustainable place.